To bid, you will need to become a registered bidder. You can register here. If you already are registered, then log into your account and choose the listing you would like to bid on. Input the price you would like to bid and click "Bid now". How do I become a registered bidder? Create a Bloodstock.com.au account here and tick "Become a registered bidder". Follow the prompts and you will be required to verify your email and then your mobile phone number. Once you have received the confirmation you can start bidding straight away! Why do I have to be verified as a bidder? This is to make sure only serious bidders are involved in the auction. Auto bidding occurs when a bidder has placed a maximum bid amount. The system will automatically generate bids on behalf of the bidder up to the maximum bid amount. If you enter the same amount as another bidder, the first bidder to place the maximum bid amount will be the winning bidder of that amount. A maximum bid is the highest amount that you are willing to pay for that listing. This will allow the system to auto bid on your behalf up to the maximum amount set. You will receive email notifications for all bids that you have placed on an Everyday Auction listing. No, once a bid is placed it cannot be retracted. Make sure you check our T&Cs to fully understand your responsibilities as a bidder in an Everyday Auction. How will I know when I have won an auction, and how do I pay for my horse? You will receive an email confirming that you are the highest bidder. On the email confirming that you are the highest bidder, there will also be a link to the Bloodstock.com.au escrow service Equine Safepay. Follow the prompts to pay for your purchase. Why do I need to pay through Equine Safepay? This is safest and easiest way for both parties to complete the transaction. Equine SafePay ensures the money sits with a custodian until you receive the horse and the related ownership papers. Once the horse and papers have arrived, you will need to approve for the money in trust to be released to the vendor. Why does the end time of the auction keep extending? If a bid is placed within the last 10 minutes of an auction, the end time will extend by 10 minutes. This is similar to an auctioneer saying "going once, twice, three times..." as it allows other bidders the time to counter bid on the auction. How do I inspect a horse? As per any other Bloodstock.com.au listing, we encourage doing your own checks and inspections prior to purchasing a horse. Inspections can be arranged with the vendor of the horse, all their contact details will be available on the listing page. If you are unable to inspect a horse due to location you can ring one of the bloodstock.com.au agents on 1300 711 683 to help connect you with local vets and agents. Can I have the horses scoped or vetted before purchase? Yes, but this needs to be arranged with the vendor prior to purchase. Vet checks and Scoping is at the expense of the purchaser. Can I take out insurance? If you wish to take out insurance on your horse, please call Inglis Insurance on 02 9399 7999. Please note we do not cover fall of hammer insurance. Half brother to 5 winners. By Smart Missile, sire of over 100 winners this season. Big strong athletic gelding, been given time to mature. Only had a handful of starts. Required to trial prior to racing. Vet and other inspections welcome. SMART MISSILE (AUS) (Bay 2008-Stud 2012). 3 wins-2 at 2, ATC Todman S., Gr.2. Leading Aust. First Season Sire 2015-16. Sire of 362 rnrs, 229 wnrs, 10 SW, inc. Maid of Heaven (ATC Spring Champion S., Gr.1), Smart Melody, I'll Have a Bit, Debellatio, Jericho Missile, Beauty, Final Award, Irish Bet - Hong Kong Bet (H.K. ), Exocet, Sassy 'n' Smart, SP Rocket Fuel, Smart Elissim, Aim Smart, Smart Coupe, Rocketeer, Smart Amelia, Smart Manoeuvre, etc. Brilliant Proposal (g by Nadeem) 4 wins at 1000m, 1200m, A$16,480, HK$3,745,050 in Aust. and HK, HKJC Man Cheung H., Briar H., Europe H., 2d HKJC American Club Challenge Cup, Manawatu Racing Club Challenge Trophy H., Lung Cheung H., Volunteers' Challenge Cup, Dunbar H., Houston H., Grayburn H., 3d HKJC Police Cup, Deauville Yearling Sales H.
Fine Rock (g by Teofilo (Ire)) 2 wins at 1100m, 1200m, WATC Network Aviation Sprint H., HKJC KC Tai Fung Coach H., 2d HKJC HKU Medicine & Engineering H., 3d WATC Westspeed H.
Babur (g by Wonderful World) 5 wins at 1100m, 1200m, 2d MRC Catanach's Jewellers H.
Let Me Finish (g by Hussonet (USA)) 3 wins at 1200m, 1400m in Aust. Midweek Hussler. 2 wins-1 at 2-at 1100m, 1400m to 2017-18 in Aust. CELESTIAL CHOIR (c Celestial Dancer) 11 wins to 1400m, A$643,785, QTC Cup, Gr.2, STC Civic H., L, AJC Ludwig Leichardt Flying Welter H., STC Leopardstown H., Air Caledonie Welter H., AJC Oopik H., Tamarama Flying Welter H., STC Ansett Australia Welter H., Tod Maid H., Como H., 2d AJC Apollo S., Gr.2, NSW Tatt's RC Chelmsford S., Gr.2, STC Premiere S., Gr.2, AJC Liverpool City Cup, Gr.3, STC Festival H., L, 3d QTC Stradbroke H., Gr.1, AJC Warwick S., Gr.2, STC Missile S., Gr.3, BTC AWA S., L, GCTC Goldmarket H., L, SCTC Glasshouse H., L, 4th AJC George Main S., Gr.1, STC Shannon H., Gr.2. Jubilee Song. 4 wins-1 at 2-at 1100m, 1200m, A$110,950, AJC Staff of the Month H., STC Farewell Bryan Guy H., Club Hotel H., Night Racing 2YO H., 2d STC Auswide Interiors & Lafarge Welter H., Crescent Timber H., Become a Member Welter H., 3d AJC McWilliams Wines H., Enfield RSL Club H., STC Franklins H.
Lord Rory. 2 wins at 1100m, 1200m, STC Day & Night Chemist Wentworthville H.
A New Song. 2 wins at 1200m, STC Paraquad Independence Day H., 3d STC Ryan Booker H. Producer. ISLAND MORN (c Marooned) 15 wins from 1300m to 1800m, A$648,730, WATC Beat Diabetes 2 S., Gr.1, Railway S., Gr.1, VATC Memsie S., Gr.2, WATC AJ Scahill S., Gr.3, Hyperion S., Gr.3, Belgravia S., L, Coca-Cola Quality Sprint H., Folklore H., Jungle Mist H., Rory's Jester Welter H., 2d WATC Easter S., Gr.3-twice, WATC Quality S.H., Gr.3, Challenge S., L, Farnley S., L, Raconteur S., L. Sire. DAWN RAMPAGE (f Gielgud) 8 wins from 1200m to 1800m, A$80,495, WATC December H., L, Emu Export H., Gloaman Welter H., Reach For the Stars H., 2d WATC Qantas Cup, L. Producer. BLACK GEORGE (g Blackfriars) 9 wins to 1400m, A$250,310, Kalgoorlie Boulder RC Hannan's H., L, WATC Irish Day at Belmont H., Perth Racing Members H., 2d WATC Playeronline.com.au H.
OCTOBER DATE (g Barely a Moment) 5 wins from 1200m to 2000m, A$230,915, SAJC Chairman's S., Gr.3, Sportingbet H., Corporate Events at Morphettville H., Holdfast Insurance H., Zanimal Tripod H., 3d SAJC Lord Reims S., Gr.3. Mossie Bite (c Twig Moss) 20 wins-1 at 2-from 1000m to 1600m, A$96,005, VRC Mollison H., VATC Sun H., Liberal H., GH Davey H., Ripponlea H., 3d VATC Debutant S., Gr.3. 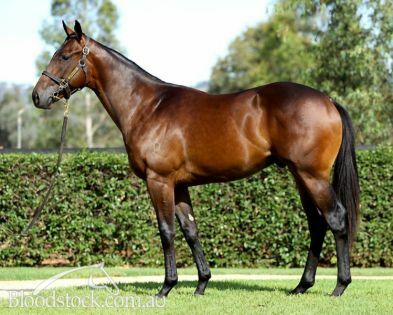 Ace in Triumph (c Hunka Papa) 3 wins-2 at 2-to 1200m, WATC Elms H., Carbineer Quality S., Barracks H., 2d WATC Inverness H., 3d WATC Ascot S., L, 4th WATC Karrakatta P., Gr.2. FIVEOCLOCKSHADOW (g Langfuhr) 2 wins-1 at 2-at 1350m, 1400m, A$167,500, VRC Springtime S., L, BTC Doomben Slipper S., L.
The Pupster (g Bel Esprit) 4 wins at 1200m, 1600m, 2d WATC Warnbro Fair Liquor Store 2YO P., 3d WATC Perth S., L.
SPARTA (g Beneteau) 5 wins to 1200m in Macau, Macau Sprint Trophy, L, 3d Macau Berlin H.
Room for a Slew (g Air de France) 3 wins-1 at 2-at 1300m, 1400m, A$88,928, 42,700Rgt., S$78,750 in Aust., Malaysia and Singapore, STC Hollywood Park 2YO H., Perak TC Class 1 H., 2d STC Ajax S., Gr.3, 4th QTC Grand Prix S., Gr.2. Race Record: 5 Starts 0-0-0 A$900. 25/Jan/2017 2nd of 5 --trial--Newcastle JC Barrier Trial, 800m. Valley Royal was 1st and Matchfox 3rd. 22/May/2017 7th of 8 --trial--Wyong RC Barrier Trial, 845m. Ayeteem was 1st and Cutie Nar 2nd and Condor 3rd. 05/Jul/2017 6th of 9 --trial--Wyong RC Barrier Trial, 1000m. Miss Gosford was 1st and Desi Style 2nd and Mister McRae 3rd. (18.7) Parkes JC Telescope Tyres & Batteries Maiden P., A$25,225, 800m, time 0:44.67. Track good(3). Carried 57.50kg. Dollar Thief was 1st and Beechal 2nd and Invincible Thunder 3rd. Trainer: J P Curran. Owner: A R Bell. Jockey: M A Cahill. (30.3) Cowra JC McDonalds Maiden H., A$10,000, 1375m, time 1:24.38. Track good(3). Carried 57.00kg. Keeper Girl was 1st and Sheboygan 2nd and Unresolved 3rd. Trainer: J P Curran. Owner: A R Bell. Jockey: A Cavallo.